Tis the season for good news, kids. 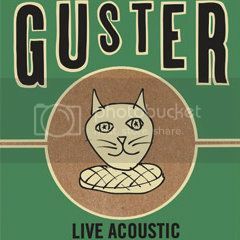 Thanks to a headsup from BlindedBySound contributor Stephanie, I became aware our friends Guster are releasing a 16-track acoustic live album in early January. A limited number of CDs will be pressed and it will be available digitally to the universe forever on after (okay, I haven't verified forever on aftter but go with me on this). The 16-tracks were taken from the band's acoustic tour which found the band traveling with a small string section. The tracklisting is pretty heavy on the Easy Wonderful album but there are several goodies from throughout the band's career and I pre-ordered the hell out of this thing within seconds of learning of it. "Diane" is a particularly happy inclusion for me, it being a personal favorite and one they've not performed at either of the shows I've attened. I'm also pretty excited about "Do You Love Me? ", "Satellite," and "Empire State." Oh, hell, this whole thing is going to be awesome and they're estimating a ship date of January 3 with likely deliveries around January 8. But wait… there's more. If you think seeing Guster and a few string players doing acoustic songs sounds like the type of thing you'd like to see, they'll be on the road doing just that. This is where it gets better for me: 2 shows in Atlanta, 1 in Birmingham. There's no way I can do all three but wouldn't bet against me hitting the 'Ham on January 8 at Workplay Theater. Below you can find the full tracklisting for Live Acoustic and two vidoes: the first is a tralier for this new release and the second is the band performing "Rocketship" in this acoustic/string style. We've also got the tour dates for the announced winter shows, so see below and get ready for the good things coming your way. Guster is making my Christmas very merry today.